Are you looking for an Euronics deal in Pulborough? Then visit our main warehouse and retail outlet in Storrington. Less than five-miles away from Pulborough, you'll find us on the Water Lane Industrial Estate and open six days a week. We are able to stock 1000's of models in washing machines, tumble dryers, cookers and ovens ready for immediate despatch to our customers in Sussex. The majority of these models are sourced from Euronics, a European wide supplier who bring huge benefits to ourselves by way of the massive collective buying power it creates. 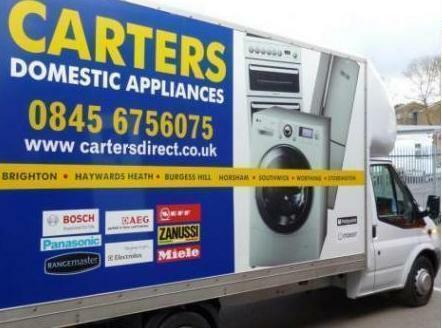 Carters Domestic Appliances can buy the right stock at the lowest prices. It means we can pass on these savings in store and online to our customers. Well worth the short journey, you won't be disappointed with the range of stock and choice on display; including smaller electrical goods for the home such as kettles, toasters and irons. Microwaves, in particular, are big sellers at all of our outlets. Customers from Pulborough choosing to buy Euronics washer-dryers and dishwashers from Carters in Storrington, know they can do so with confidence. We stock over twenty leading brands in white goods and home electrical appliances from all your favourite manufacturers. Innovation in engineering and design leads to energy, time and money saving models from Miele, Bosch, Blomberg, Neff, Beko, Siemens, AEG, Hoover and Zanussi and more. It's worth considering, however, that every mechanical appliance will break down eventually; but our customers can rest assured that in the unlikely event of a failure, or an issue with any item sold by us in first few years of use, we will endeavour to make every effort to return it to full working order as quickly as possible. For this reason, although many of our appliances carry an extended 3-year and 5-year warranty, there are additional cover options available to purchase to provide extra peace of mind. We do not sell second hand machines or upgraded appliances unless they are offered to us direct from a manufacturer to be sold as a special deal, and particular warranty conditions may be applied to these products. We deliver to homes in Pulborough and surrounding areas, most days of the week. Our delivery crews can quickly deliver and install your new machine and remove the old appliance and are competitively priced. Freestanding and integrated models are fitted according to the manufactures specifications and in line with the applicable health and safety regulations. Before they leave you, the crew will help you get to grips with your new appliance and explain functionality aspects backed up with a wealth of product knowledge to help you get the best use possible. They will also take away all related transit packaging materials as part Carters responsible recycling policy. Start shopping for you new Carters Euronics domestic appliance today: visit our stores on a high street new you in Sussex, browse on line, or call us in Storrington on 01903 745100 to get not just a good deal, but a deal you won't find anywhere else.